Abstract art lends itself to the senses of freedom and free expression. Boxing it in with the limits of the canvas is almost a disgrace. I can't think of a better way to present this type of artwork to the viewer other than big and bright. You are probably aware that color is such a big part of abstract art, but equally being BIG. 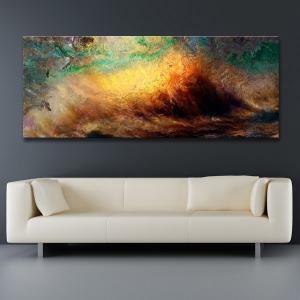 Without the artwork's grand nature the color does not really transcend into the realm of the senses. And this is what abstract art is for me, art that has the ability to enter the senses on another level. I appreciate art that is both simple and complex; having just the right about of balance it is neither, and in-turn becomes art that can be enjoyed beyond thinking, classifying, and any other thing that our brains want to do to it. Abstract art of a grand nature is just there. It belongs. It is beauty. It moves you. You enjoy it. That's what I want to create for you.